The White House has assailed President Donald Trump's critics after he was cleared of Russian election collusion. 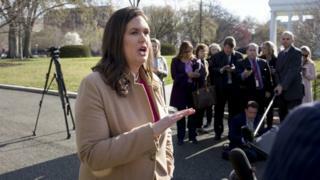 Press Secretary Sarah Sanders told cable morning shows that Mr Trump is happy for the full report by special counsel Robert Mueller to be released. She said the summary of the findings issued by the attorney general amounted to a full vindication of the president. Mr Mueller's long-awaited report, however, stops short of exonerating Mr Trump of obstruction of justice. It was the culmination of a nearly two-year investigation that saw some of the president's closest former aides prosecuted and, in some cases, imprisoned, though not for collusion with Russia. White House aides took to the airwaves on Monday to depict the president as the victim of an inquiry that should never have been allowed. When asked whether Mr Trump would support the release of the full report, Mrs Sanders told NBC News' Today programme: "He's more than happy for any of this stuff to come out." Speaking on CNN later on Monday, Mrs Sanders said it was "outrageous" that Democrats and journalists had spent two years portraying the president as an agent of a foreign power. "That's equivalent to treason," said the press secretary. "That's punishable by death in this country and that is outrageous." Mrs Sanders said the "obscene lie" was used to try "to overthrow the president of the United States". White House adviser Kellyanne Conway on Monday called on Democrat Adam Schiff, Chairman of the House Intelligence Committee, to step down. "He ought to resign today," she told Fox News. "He has been on every TV show 50 times a day for practically the last two years promising Americans that the president would be impeached or indicted." "It was a complete and total exoneration," Mr Trump declared on Sunday, even though the report specifically states that he has not been fully exonerated. Speaking at Palm Beach International Airport in Florida, he said: "It's a shame that our country had to go through this. "To be honest, it's a shame that your president has had to go through this. Before I even got elected it began and it began illegally." The Republican president said the inquiry was an "illegal takedown that failed". In his four-page summary released on Sunday, Trump-appointed Attorney General William Barr wrote: "The special counsel did not find that any US person or Trump campaign official conspired or knowingly co-ordinated with Russia." Republican Senator Lindsey Graham summed up the conservative response on Monday, telling reporters Mr Trump was stronger today than ever. "This cloud has been removed," he said. "To those wanting an outcome of removing Trump, you're going to be disappointed." Opposition Democrats are demanding full access to Mr Mueller's report. 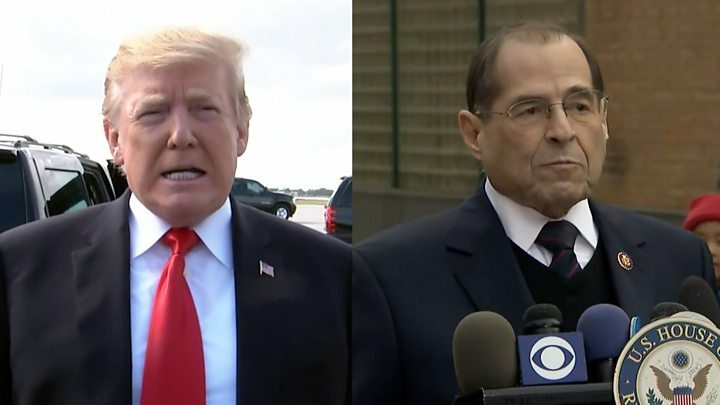 Legally, the House Judiciary Committee will want to get its hands on the full Mueller report. They will want to see why Robert Mueller felt he couldn't exonerate the president on obstruction of justice. And remember, obstruction of justice is one of the "high crimes and misdemeanours" that can lead to impeachment.